Part One in Pavarti K Tyler's serial novel Two Moons of Sera. Told from the point of view of Serafay, a teenager born to her Sualwet (water dwelling) mother. Serafay is a hybrid of her mother's genetics and those of the Erdlander (land dwelling) people thanks to genetic experiments conducted while she was a prisoner of the Erdlanders. One of the best qualities of this novel is that the author chose to tell it in small increments at a time. The reader will get only a little bit of the story and be anxious for more. Serafey is the main character. She is not full Sualway or full Erdlander, but half and half. This characteristic means that Sera is not fully accepted in either group. She is effectively an exile. At first, the book is more descriptive. However, the action quickly commences as Sera is drying out pages in a book when a random man shows up and snatches some. She knows she must find out who this man is and why he would bother snatching those pages. The story takes off from there. 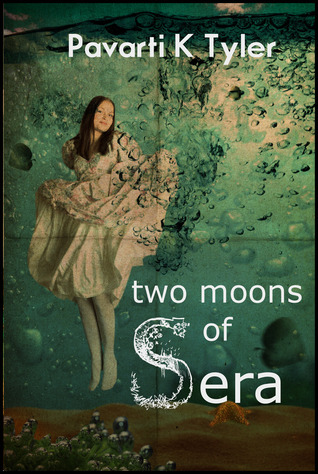 From what I've read, I can tell I will enjoy Sera's character. The secondary characters, at least those who are decent to Sera, are fun to get to know as well. The events are interesting and the writer adds in plenty of description. The reader will enjoy this small part of the book and wait for the next installation. This book is recommended to teens and young adults. Look for more contests on this blog Anyone who reads my review has a good shot at winning :) Thank you all for stopping by!